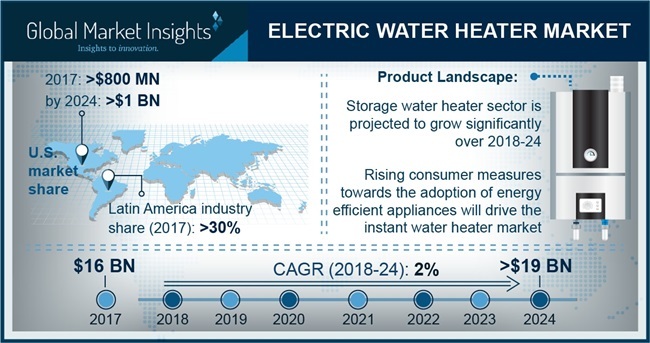 Electric Water Heater Market size is set to exceed USD 19 billion by 2024; as reported in the latest study by Global Market Insights, Inc.
Increasing investments toward the development of existing infrastructure coupled with ongoing economic transformation will drive the electric water heater market. Government initiatives toward the adoption of energy efficient heating systems along with shifting trends toward hospitality and tourism sector will complement the business outlook. For instance, the world bank group in 2016 had approved the funding of USD 50 million as a part of “International Development Association Credit” for Benin’s tourism sector development.